When someone walks along the Mexican streets and passes through a market , a restaurant or a fonda; Where there are glass jars or beautiful ornamented bottles full of pickled chilies and vegetables... One gets the immediate desire of trying them. The pickled chilies and vegetables consist of jalapeno peppers combined with a wide diversity of vegetables , which are cooked with vinegar and aromatized with herbs and spices. The combination results delicious, strong and spicy; which can be accompanied in a special way with any dish. To make this recipe you have to cut, fry and cook ingredients – it may sound complicated but the reality is that you won’t have any problem. This recipe is prepared with many vegetables but if there would be another special vegetable that you would like to try pickled, just include it. We recommend the cucumber and the chayote. Try to use peppercorns in this recipe, instead of ground pepper so it will have more aroma and flavor. In this recipe any type of vegetable oil can be used. In 25 minutes the preparation of the pickle chilies and vegetables will be ready and then they have to be left resting for 1 day. This recipe yields approximately 2 jars. Halve 8 cambray potatoes, then reserve. Cut 1/4 of a cauliflower into small bouquets, then set aside. Cut 10 jalapeno peppers into strips, then set aside. Cut the tail of 5 spring onions, discard the tails and reserve the spring onions. Slice 2 zucchinis and 3 carrots; then reserve. Separate the garlic cloves from 1 garlic head and peel them; then set aside. Heat in a saucepan over medium heat 1/4 cup of vegetable oil. The halves of the Cambray Potatoes that were cut. The Cauliflower bouquets that were cut. The slices of the Jalapeno Peppers that were cut. The Spring Onions that were cut. The slices of the Carrots that were cut. The Garlic cloves that were peeled. Mix the saucepan ingredients and fry them for about 3 minutes, until they are lightly fried; stir regularly. 2 cups of White Vinegar. 1½ cups of Water (12.6 fl oz). Mix all the saucepan ingredients and bring the mixture to a boil over high heat. When the mixture boils reduce to low heat, cover the saucepan and cook the ingredients for about 15 minutes, until the vegetables are moderately cooked; stir occasionally. Incorporate in the saucepan the slices of the zucchinis that were cut, mix the ingredients and cook them for about 3 minutes, until the zucchinis are well cooked; stir occasionally. The zucchinis are added at the end because they are very soft and they would fall apart if they are cooked for a long time. Turn off the heat, wait for the pickled chilies and vegetables to cool and transfer them to 2 large glass jars, with a kitchen spoon. Upon completion close the jars. Leave the pickled chilies and vegetables resting in a fresh and airy place or in the bottom part of the refrigerator for 1 day, so the flavors and aromas are absorbed. * The pickled chilies and vegetables may last up to 1 month in the refrigerator. 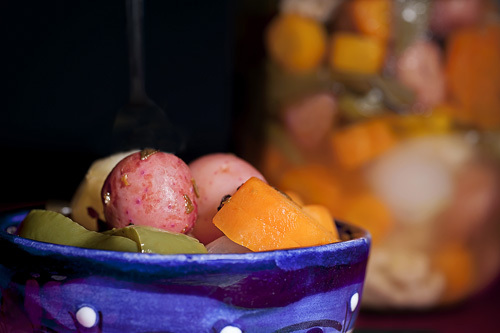 Variations: In the Mexican cuisine there is a world of pickles with the pickled chipotle peppers , the pickled red onions and chilies , the white pickled , the pickled ancho peppers , etc. Did you like the Chiles? These jalapeno peppers are fresh and they have a very good hotness, perfect for this recipe. These are the glass jars that you have to use to store your pickled chiles and vegetables. Do you need marjoram? Buy the Spice Hunter it has a very good aroma, very good flavor and the best is that it is organic.